Performance gaps are not necessarily a result of a lack of skills or abilities and in many cases training is not the right solution to achieve the desired performance improvement. Elements such as employees not understanding performance expectations due a lack of communication of those expectations by their manager/supervisor and obstacles or barriers that impact performance such as the physical layout of the workplace, material handling processes and the quality of equipment and materials are generally not going to be solved by providing training to the employees performing the work. If the employee is identified as not knowing how to correctly use equipment or as handling products or materials in a way that is creating quality or scrap problems, there may be an opportunity to improve performance via training. If new systems or equipment is introduced, it can be assumed that employees will not have the necessary skills, abilities or knowledge to operate it - an obvious training need. The Needs Assessment identifies performance gaps and whether training is an appropriate solution to fill the gaps. The primary reasons for conducting a needs assessment is to determine the causes of poor performance; determine whether training is needed; determine content and scope of training; identify desired training program outcomes; and to create credible documentation and a business case to secure management support and budget allocation. Training Needs Assessment can be relatively simple or highly complex. The larger the organization, the more complex that the needs assessment tends to be as there are typically more employees, more departments and often a broader range or equipment and processes. As with other areas of this website, needs assessment program ideas are being presented at a relatively simple and straightforward level in order to provide you with information that you can use without requiring significant time and resources to manage it. There are two primary areas to look at in a needs assessment - the organization and individual employees. Many sources can provide this information including: strategic plans; mission statements; performance, productivity and quality metrics; plant and equipment budget plan; etc. In reviewing these types of elements, you will be able to identify areas that may require training projects that can range from a single or small number of employees up to the entire workforce. It is likely that a comprehensive analysis of both organizational and individual elements will result in more than one training need being identified. The needs should then be prioritized based on the potential impact of the training, the importance of addressing the performance gap, time requirements and deadlines for implementing training (in the case of new equipment or legal compliance issues) and the availability of budget/money to implement training programs. Training plans can then be created based on the priorities and available budget and then executed. It is recommended that you review the Calculating Return on Investment of Training section of this website for further information on measuring the success and impact of your training activities. 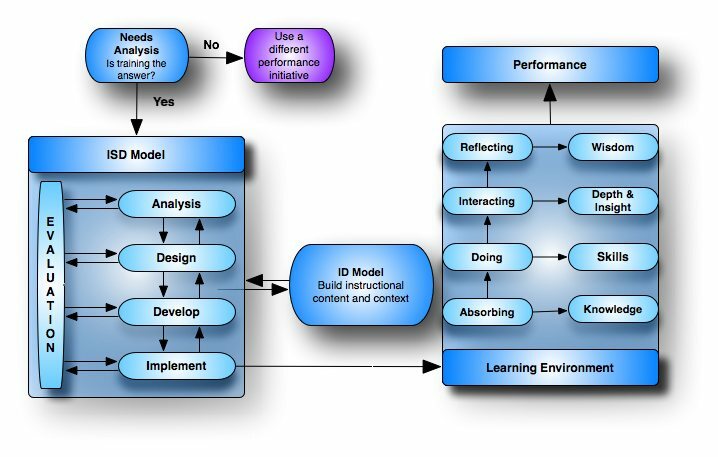 The Concept Maps depicted below provide an excellent source of information for Learning and Instructional Design. On the source website you can click on a desired topic on the Map which will provide you with full details of each element.